A gentleman in striped pants, black jacket, white shirt, and black leather gloves investigates a sign laid out on a forest floor. The sign is composed of twigs and stones—but the question is: what is the profession of the person who laid out the sign? Apologies for this update coming so late, especially as ↵Alhambra posted the right answer—Congratulations!—already on 23 October 2013: The original profession of the man who laid out the sign was: sailor. That way the victory in the 59th installment of zeph’s pop culture quiz was snatched away from Alexander Rabitsch who already was close when ↵he wrote in the comments: ‘Mr. 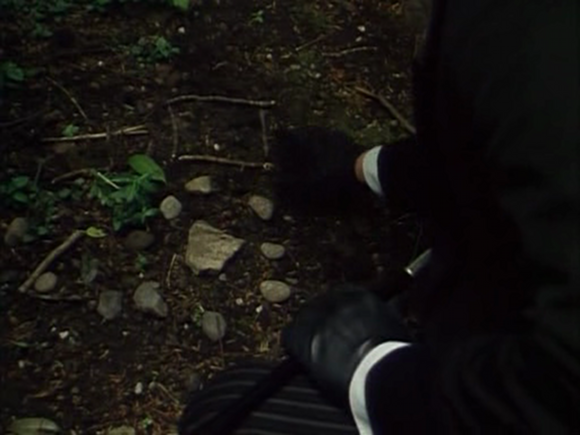 Jonas Oldrace is a master-builder.’ That way he clearly signalled that he had deduced that the screencap was taken from the ↑TV-series episode ‘The Norwood Builder’ (Grieve 1985) based on ↑Sir Arthur Conan Doyle‘s short story ‘↓The Adventure of the Norwood Builder‘ (1903). So, the gentleman sporting striped pants in the picture is ↑Sherlock Holmes, impersonated by actor ↑Jeremy Brett—the definitive moving-image Holmes! The question was a bit tricky, I confess, because the sailor turned tramp does not at all appear in Doyle’s story, but was added for the television dramatization. DOYLE, Sir ARTHUR CONAN. 1903. The Adventure of the Norwood Builder. Collier’s Weekly September 1903, Strand Magazine October 1903. GRIEVE, KEN. 1985. The Norwood Builder [TV series episode]. The Adventures of Sherlock Holmes, ep. 10. Manchester: Granada Television. Mr. Jonas Oldrace is a master-builder. Gardener, sailor, brick layer, …?